Geologix Limited announces that it has secured a contract with Blue Eagle Lithium Inc. to provide a fully integrated asset management system for its activities in both conventional brine and Petro-Lithium extraction. 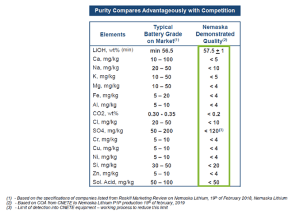 Nemaska Lithium Inc. recently announced that it has commenced the qualification of its high purity lithium hydroxide monohydrate products with over 20 customers worldwide. QMC Quantum Minerals Corp. reports that with diamond drill and support crew on-site, the primary phase of holes has been finished at the 100%-owned Irgon Lithium Mine Project of the company situated within the productive Cat Lake-Winnipeg River rare-element pegmatite field of S.E. Manitoba, which also hosts Cabot Corporation’s nearby Tantalum Mining Corporation of Canada (TANCO) rare-element pegmatite. QMC Quantum Minerals Corp. takes pleasure in announcing that it has started drilling on its Irgon Lithium Mine Project situated within the prolific Cat Lake-Winnipeg River rare-element pegmatite field of S.E. Manitoba, which also operates the adjacent Tantalum Mining Corporation of Canada rare-element pegmatite. QMC Quantum Minerals Corp., is pleased to provide an update on the company’s 100% owned Irgon Lithium Mine Project located within the prolific Cat Lake-Winnipeg River rare-element pegmatite field of South East Manitoba which also hosts Cabot Corporation’s nearby Tantalum Mining Corp. of Canada’s rare-element pegmatite. MGX Minerals Inc. is pleased to announce that joint venture partner Chilean Lithium Salars is drilling at the Francisco Basin Project located 30 kilometers south of the Salar de Maricunga. MGX Minerals Inc. reports that joint venture partner Chilean Lithium Salars has mobilized a drill to the Francisco Basin Project located 30 kilometers south of the Salar de Maricunga. MGX Minerals Inc. reports that joint-venture partner A.I.S. Resources has commenced drilling at the Salinitas lithium project in Argentina. Fluor Corporation announced today that ioneer Ltd. has selected Fluor to deliver its lithium and boron mine outside of Tonopah, Nevada.